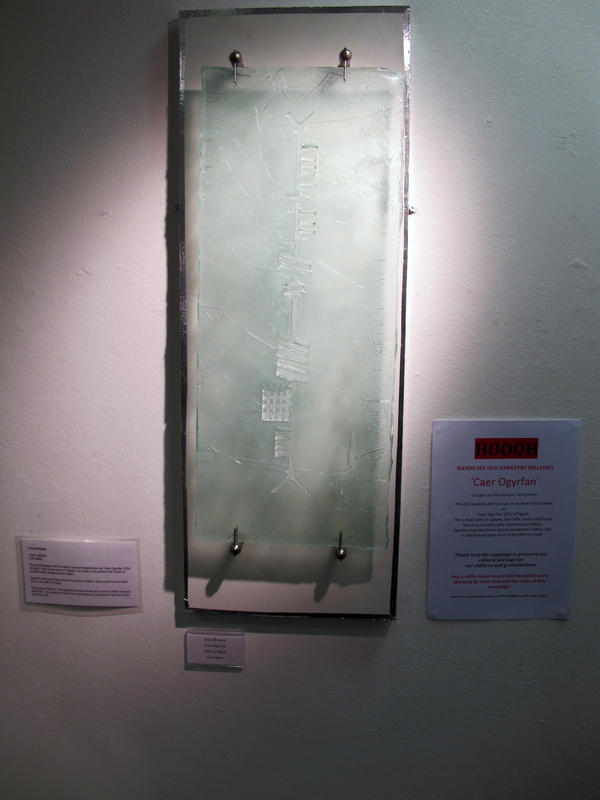 This is the beautiful glass work piece donated by Tony Roberts, glass sculptor to raise funds for the hillfort campaign. It is on display until 19th April at The Willow Gallery Oswestry in their Text exhibition. We got off to a good start with raffle tickets last Friday evening at the opening event, and these will be on sale at The Willow Gallery from Tuesday. and announced in The Willow Gallery, on this blog and on Facebook. and read from the bottom to the top. The text has been cropped and highlighted in a separate shot above. Apparently Ogham lettering was often incised on the sharp straight edges of stones. name Caer Ogyrfan meaning The fortress place of Ogyr – her father. « Artist Market in Wrexham – calling all artists and craftspeople……..